I came back the day before yesterday from Las Vegas after playing in Millionaire Chess tournament that was held during 9th to 13th October at Planet Hollywood. My son Ahyan Zaman also played the tournament while my wife, daughter and mother-in-law accompanied us. 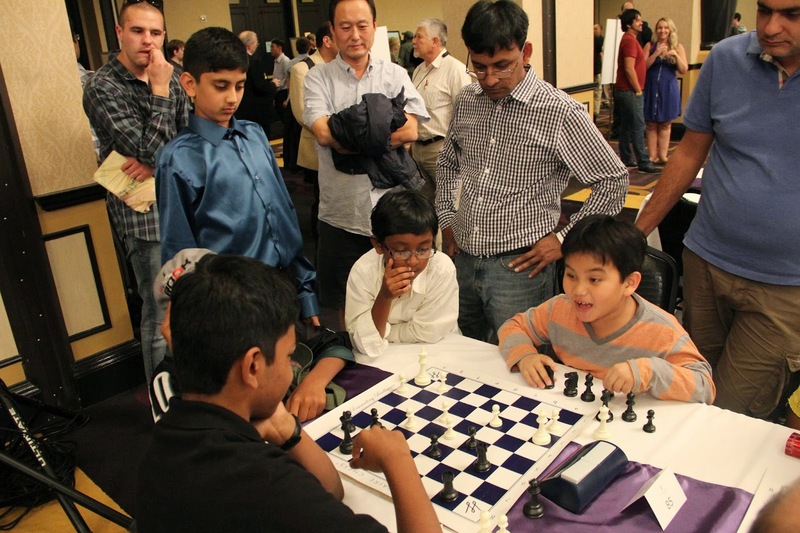 We thoroughly enjoyed participating in this high stake chess tournament which exceeded our expectations in all angles. 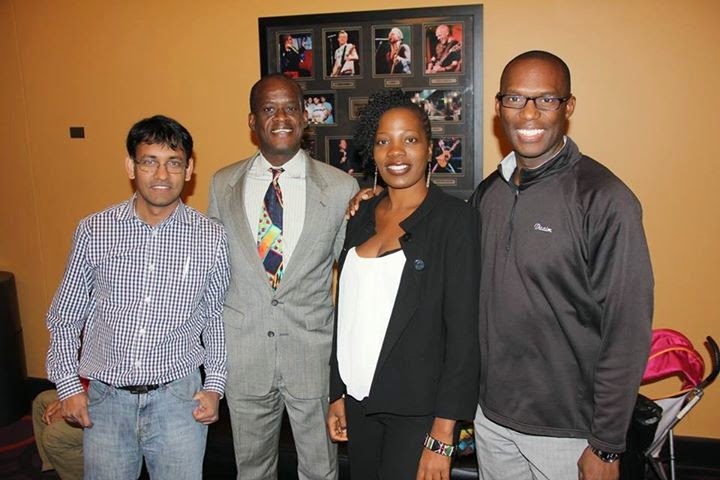 MC partners GM Maurice Ashley and Amy Lee went extra miles to make sure everything about this tournament is classy and beyond comparison with other traditional or regular chess tournaments in terms of playing experience or following the event as a spectator. We flew from San Francisco at 8th night and after checking in at Planet Hollywood, we saw Amy Lee and Maurice Ashley well after midnight still receiving the guests and players at conference center reception desk. Each player received a gift pack that includes a nice leather chess bag, 6 months free ICC membership, MC branded chocolate, wrist band, various discount coupons amongst. The next morning we attended the opening breakfast buffet where famous Indian-Japanese born Comedian Dan Nainan made started the event with funny jokes that made us laugh aloud. That's when I met lot of our team mates whom I have been knowing for last 8/9 months online - Daaim, Adia, Brendan, Keith, Jones, IM Akshat Chandra and his father, Christopher Yoo and his father to name a few. We also had big group from Fremont there - other than me and Ahyan there were Shafieen and his parents, coach Ted, IM Ricardo, little kid Alekhine. As per my count 582 players participated in 6 sections although it may be a little more or less. After the comedy show we had speeches from GM Maurice Ashley and Amy Lee before we went out for red carpet photo shoots with Maurice in a long but quick queue. The first round started 7 minutes late of 12 noon. That I thought was a pretty good success for a first round of a first time tournament. But I saw Amy was not happy even for being only 7 minutes late. There were extensive security check including scanner, cell phone check-in station as well as separate scanner for players rest room. The playing hall was huge and square shaped. All the world champions' large pictures were showing up in banners. As players from 44 countries registered, we saw 43 flags flying around in the stage, only missing Switzerland as the Swiss player registered at the very last moment when organizers had no way to order a large new flag. I and Ahyan took picture with the Bangladesh flag on top of the stage. Top boards were played in the stage with the moves digitally getting transferred to the live broadcast camera feeds. Top camera and filming crews were hired for the event. The 3 commentators in live broadcast area were - British IM Lawrence Trent, Australian WIM Arianne Caoili and American GM Robert Hess. The live broadcast / games viewing room were adjacent but separate from the playing venue where we could go and enjoy the fun filled commentaries from them. The second round started at 7 PM. But for the rest of the events it was 11 AM and 6 PM, 2 rounds daily. There were various chess merchandises available including what MC offers in their web site's shop page. We bought hoodies and T-shirts with custom prints whatever we liked. The whole playing venue were so lively all the time no matter what time of day or night you step in. We bought 3 chess sets with Millionaire logo on the board and got this signed by GM Maurice Ashley on the back. Performance wise it was not a good tournament for me. I won 2 games, lost 3 games and drew 2 games scoring 3 out of 7 in Under 2200 section. But Ahyan won 3 games, lost 1 game and drew 3 games scoring 4.5 out of 7. This he was placed 13th to 17th jointly and received $1000 prize money. I got placed in 53rd position in my group and got $67. There was a blitz tournament at 12th October night where 200 players participate in the 4 round double game G/5 tournament. Here I scored 3 out of 8. My games can be found in these links - Game 1, Game 2, Game 3, Game 4, Game 5, Game 6 and Game 7. Ahyan lost 4th game scoresheet so here are the other 6 games played by him - Game 1, Game 2, Game 3, Game 5, Game 6 and Game 7. 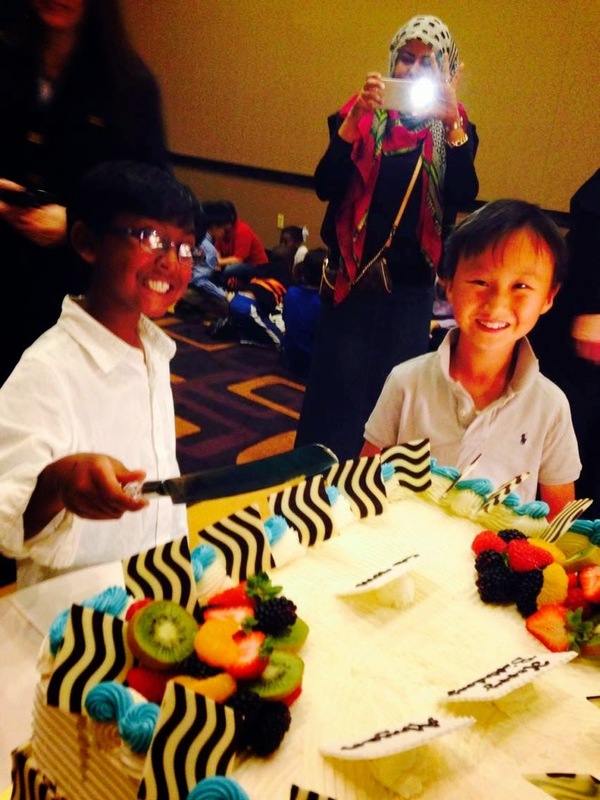 12th October was also Ahyan's birthday as well as National Chess Day of USA. Amy Lee arranged a pizza party and bug house tournament in the afternoon that day and we contributed a birthday cake to celebrate Ahyan's birthday at along with it. Kids of 13 or younger and their parents attended that event. At that party I got introduced to another Bangladeshi Shafkat who, after talking for a while, turned out to be my batch mate from Notre Dame College more than 20 years back. He was in group 7 and I was in group 1 - that's why we didn't directly know each other earlier. Shafkat's son is playing in this tournament and they flew from Long Island of East Coast for this. At 10th October Friday 5 of my colleagues from Salesforce came to the playing venue from San Francisco for 1 night to cheer me up - William Jager, Michelle Zauss, Christopher San Nicholas, John Jackson and Paul Endo. Michelle's old school friend also joined them in the venue. They actually gave me a wave during my play and the TDs had to warn them not to do so! They are a funny bunch on themselves and we hanged around for a while after my game was finished. 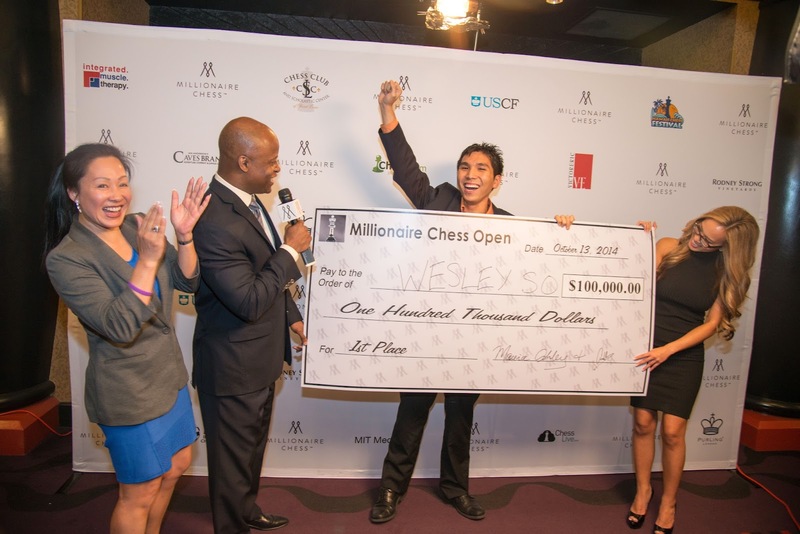 In the open section the tournament was won by Wesley So with confident play from start to finish. On the way of winning the $100,000 check, he defeated Rab Robson in the final who received $50,000 check as runner up. There were lots of coverage on this event before during and after the tournament was finished. Here are few links that shows how extensively media covered this tournament. Here are some highlights of MC#1. 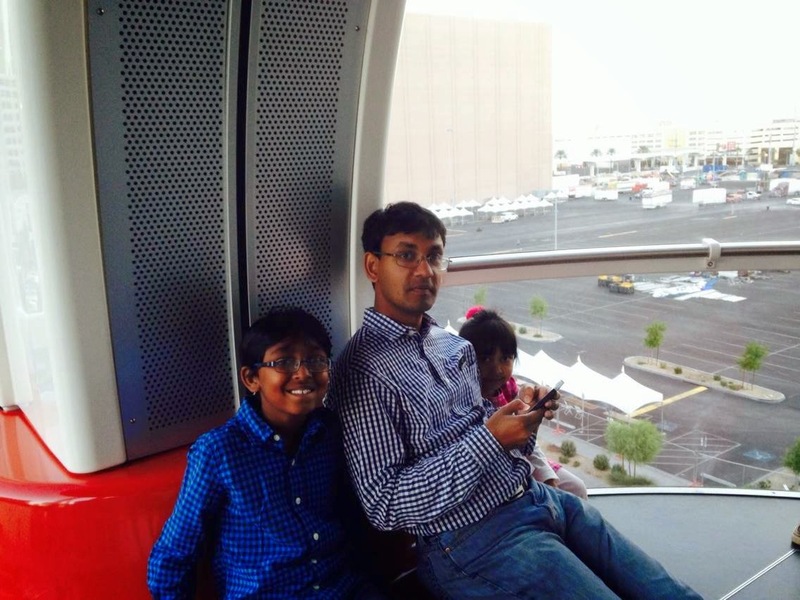 In Millionaire Monday October 13th, we visited Las Vegas's newest attraction The LINQ, the world's highest highroller which reminded me of London Eye and Dhaka's Shishu Park. We stayed back 1 more day in Las Vegas attending a time share presentation at 14th morning before coming back San Francisco at night. It was a memorable event for all of us and I already can't wait for the next year to participate in this event again. I will finish this with some comments from different players and journalists opinion on attending or following this event. 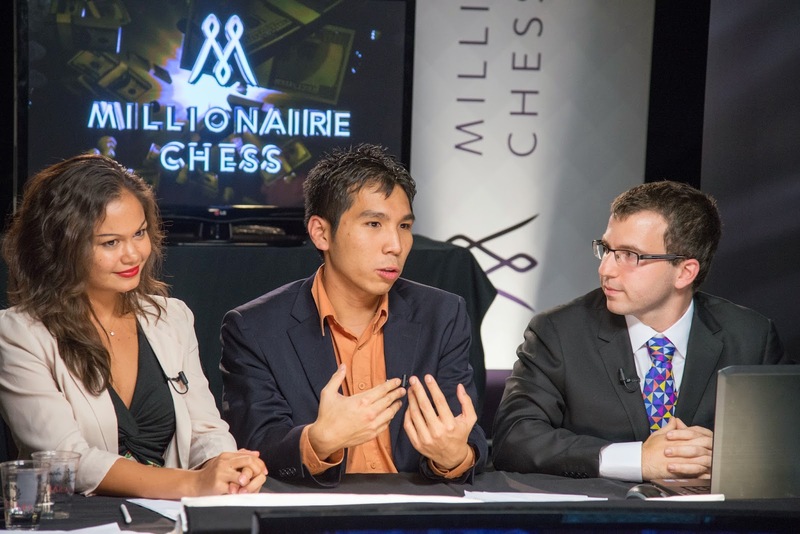 * We asked people all over the world for their thoughts on having a high stake chess tournament. While we received positive comments from many that boosted our confidence, the negative comments made us doubt ourselves: were we making the right decision? * Thank you so much Amy Lee and Maurice Ashley and the MC Team! 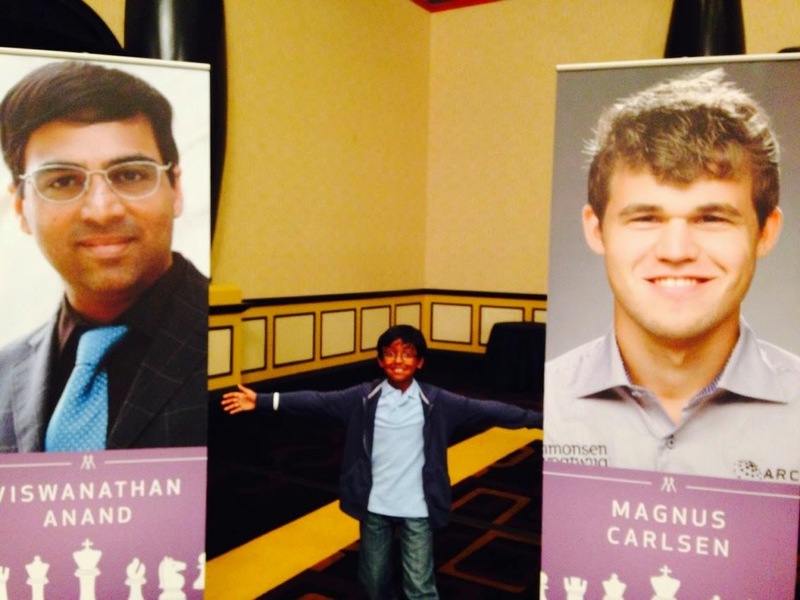 It was an amazing experience for Shafieen and all of us at the Millionaire Chess Tournament. The MC team did an outstanding job to follow through their promise to make it a memorable event for the players and their families. We are anxiously waiting for the next one! "When people start to read about hundred thousand dollar prize money, I think they are going to get interested in the game. That's the way our system works. I think to a great extent people - if something doesn't have much money in it - they kind of tend to downgrade it. When I take a look at golf with all this money, I have a lot of interest in it." 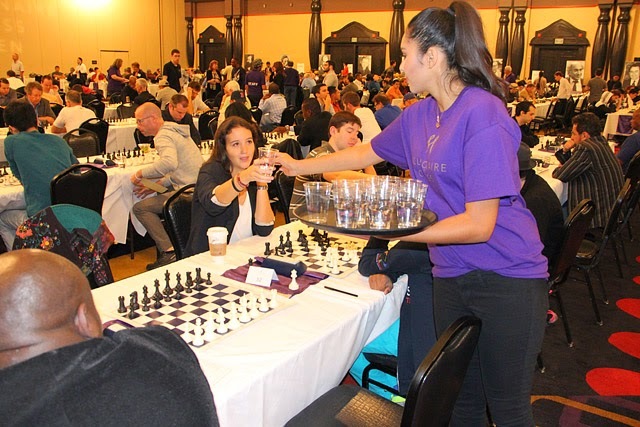 * Amy Lee and Maurice Ashley deserve a tremendous amount of praise for their efforts in making Millionaire Chess go from a shared vision to a successful operation that players, spectators, commentators, educators, journalists have been viewing over the last few days. 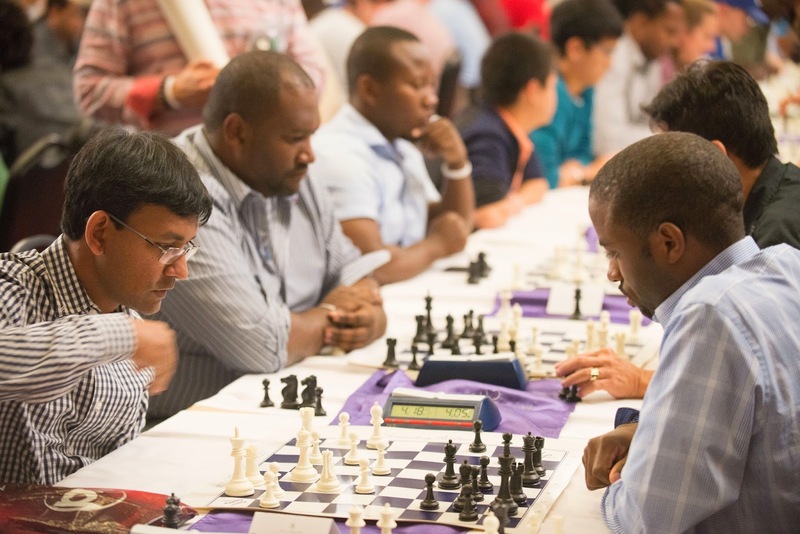 Everyone who is involved or knowledgeable about this event has to share their experience with other players and chess lovers worldwide, once the event is over. This is the best way to give back and promote this event for the future. I am sure a financial loss was taken by the organizers but if the long term vision is reached then I'm confident that could be neutralized. Amy and Maurice have played the opening moves but the onus is on us, the chess population, to make sure this event becomes an annual event, perhaps even more! So the time has finally arrived. Millionaire Chess Tournament is starting in less than 3 days from now on for the duration of 9th October to 13th October. Day after tomorrow I will be flying to Las Vegas from San Francisco with my family to participate in this tournament. 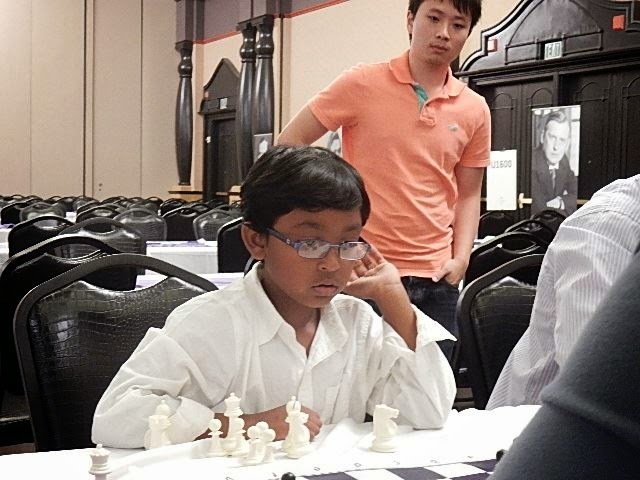 My son Ahyan Zaman will be playing in the Under 1400 section while I will be playing in Under 2200 section. My wife Shusmita Haque, daughter Suhalia Zaman and mother-in-law will be going with us as well. 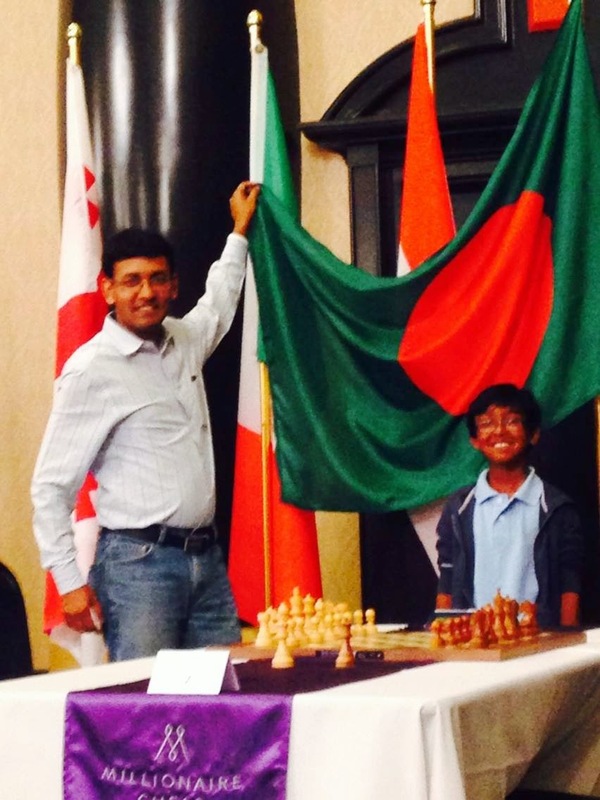 I was one of the early supporters of this event as I saw how immensely chess community will be benefited if this high stake chess tournament succeeds and becomes a repeated tournament in future. My son won the early bird lottery and got 5 nights of free hotel stay in Planet Hollywood which is also the playing venue. 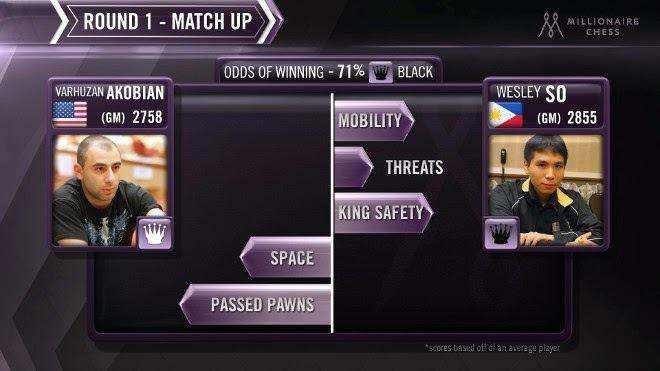 We are also the first 76 lucky participants who have been rewarded the lifetime VIP membership for Millionaire Chess, which means in all future events we will be paying only 50% of the entry fee! 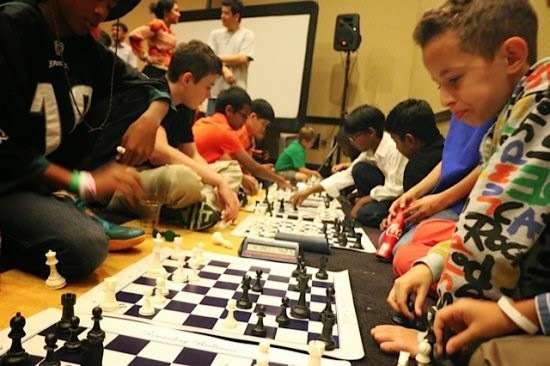 Over the last 10 months, one of the most important events in my life has been circling around this event because its not just a million dollar prize money but also a defining moment in US chess history that will be talked about for long, for many reasons. As of now 525 players from 42 countries are heading towards the sincity including more than 30 grand masters to play in this event accompanied by friends and family. Even easier will be if you download in your iPhone or Android the following mobile app "Millionaire Chess" and follow the live feeds. I am prepared - not because I will win the first prize 40 thousand dollars in my section, but because I will be getting in touch with a highly enthusiastic crowd to whom chess means a big thing in life. I and my family want to go through this absorbing experience and hopefully will have a memorable time. Wish us good luck!